Nine gymnasts represented Wood River Gymnastics Academy and two local champions were crowned during the Idaho State Gymnastics Championships March 23-25 at Boise State University. Many of the gymnasts competed in the Kinesiology Building, while a lucky few in the USA Gymnastics-sanctioned meet were able to compete in the Taco Bell Arena venue. Coach Andrea Minnick said, "The gymnasts have been competing for four months, traveling around Idaho. The state meet culminates our season. All of the WRGA gymnasts put up their season highs at this meet. They did amazing." 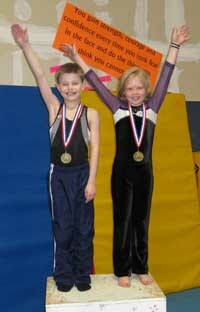 Two of the WRGA gymnasts came away with state championships. They were third-year title holder Kaiden Minnick in vault with a score of 15.4 (the highest vault score of the meet), and Kennedy Larsen in floor with a score of 9.375. About 600 of the top gymnasts from around Idaho competed in classes ranging from boys' levels 4--10 to girls' levels 3--10. Girls' levels 7-10 competed in the same place and on the same equipment as the top-rated BSU college gymnasts. Kaiden Minnick finished 5th overall (84.1) in his age division out of 15 gymnasts. He placed 8th on parallel bars (14.0), 7th on high bar (13.9) and pommel horse (11.7), 6th floor (14.4), 5th rings (11.7) and 1st vault (15.4). Peter DelaCruz finished 5th overall in the same age group. He was 13th vault (14.2), 7th floor (14.4), 6th pommel horse (11.9) and parallel bars, 4th rings (14.8) and high bar (14.5). In her first season competing at Level 4, Kennedy Larsen finished 2nd overall (36.4) in her age division out of 12 gymnasts. She also placed 9th vault (8.9), 2nd bars (9.125), 3rd beam (9.0), and 1st floor (9.375). Sabrina Bourgette competed in a new state program called the Xcel Program. Bourgette was the only gymnast in the Novice Xcel grouping, so she won all 1st place finishes. Minnick said, "This was the first time we offered this program at Idaho State Championships. According to USA Gymnastics it is designed to offer a broad-based affordable competitive experience outside the traditional Junior Olympic program to attract and retain a diverse group of athletes." "Now that the competition season is over the gymnasts are excited to begin training for the next level. Many of our gymnasts will be moving up a level. As the gymnasts master higher level skills they are able to compete at higher levels." For additional information about WRGA and their programs, visit its Web site wrgymnastics.com or call Andrea Minnick at 309-3105. Kennedy Larsen, Level 4 earned 2nd overall (36.4), 1st floor (9.375), 2nd bars (9.125), 3rd beam (9.0) and 9th vault (8.9).